Contents. List of Contributors. Preface (J.R. Bartles). Cell Polarity in the Budding Yeast Saccharomyces Cerevisiae (C. Costigan and M. Snyder). Cell Polarity and mouse early Development (T.P. Fleming, E. Butler, J. Collins, B. Sheth, and A.E. Wild). Signals and Mechanisms of Sorting in Epithelial Polarity (C.J. Gottardi and M.J. Caplan). The Generation of Polarity in Neuronal Cells (S.K. Powell and R.J. Rivas). Polarity and Development of the Cell Surface in Skeletal Muscle (A.O. Jorgensen). Polarity and Polarization of Fibroblasts in Culture (A.K. Harris). Index. Few cells conform to the stereotype of the spherical blob hastily scribbled on chalkboards and, regrettably, sometimes even displayed prominently in textbooks. Instead, real cells display a remarkable degree of structural and functional asymmetry. In modern cell biological parlance, this asymmetry has come to be lumped under the general heading of "cell polarity". Cell polarity is by no means restricted to the cells of tissues and organs, but can also be displayed by cells that lead a more solitary existence. The amazing extent to which cell morphology is correlated with function has long been a source of inspiration for biologists. Today the fascination continues unabated in the field of cell polarity, where it is fueled by an ever-deepening appreciation for the ways that fundamental cellular processes, such as membrane trafficking and cytoskeleton assembly, contribute to the establishment and maintenance of cell polarity. 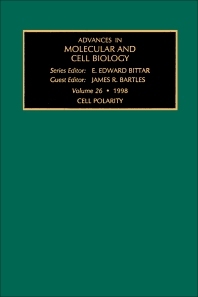 In the ensuing chapters, a collection of experts will summarize and interpret the findings obtained from basic research on cell polarity in a diverse array of experimental systems.